Important: When an adversary asks you to mount an outer volume, you, of course, must not mount the outer volume with the hidden volume protection enabled. You must mount it as a normal volume (and then TrueCrypt will not show the volume type “Outer” but “Normal”). Note that during the time when an outer volume is mounted with the hidden volume protection enabled, the adversary can find out that a hidden volume exists within the outer volume (he/she will be able to find it out until the volume is dismounted). 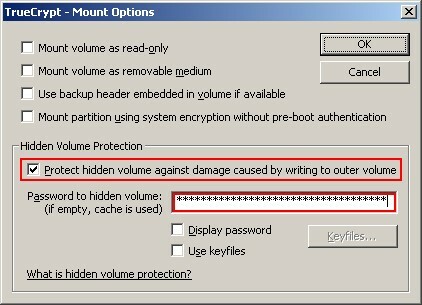 If you want to mount an outer volume and protect a hidden volume within using cached passwords, then follow these steps: Hold down the Control (Ctrl) key when clicking Mount (or select Mount with Options from the Volumes menu). This will open theMount Options dialog. 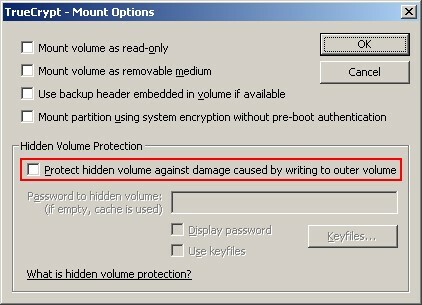 Enable the option ‘Protect hidden volume against damage caused by writing to outer volume’ and leave the password box empty. Then click OK.